Greetings to you, my subjects. 1. The letter 'U' will be reinstated in words such as 'colour,' favour,' 'labour' and 'neighbour.' Likewise, you will learn to spell 'doughnut' without skipping half the letters, and the suffix '-ize' will be replaced by the suffix '-'ise.' Generally, you will be expected to raise your vocabulary to acceptable levels (you might want to look up 'vocabulary'). speaking to a therapist, then you're not ready to shoot grouse. 7. The former USA will adopt UK prices on petrol (which you have been calling gasoline) of roughly $10/US gallon. Get used to it. It's all your blasted fault the prices are so high here. 8. You will learn to make real chips. Those things you call French fries are not real chips, and those things you insist on calling potato chips are properly called crisps. Real chips are thick cut, fried in animal fat, and dressed not with ketchup but with vinegar. 9. The cold, tasteless stuff you insist on calling beer is not actually beer at all. Henceforth, only proper British Bitter will be referred to as beer, and European brews of known and accepted provenance will be referred to as Lager. South African beer is also acceptable, as they are pound for pound the greatest sporting nation on earth and it can only be due to the beer. They are also part of the British Commonwealth - see what it did for them. characters. Watching Andie Macdowell attempt English dialogue in Four Weddings and a Funeral was an experience akin to having one's ears removed with a cheese grater. Ditto Kevin Costner as Robin Hood. America. Since only 2.1% of you are aware there is a world beyond your borders, your error is understandable. You will learn cricket, and we will let you face the South Africans first to take the sting out of their deliveries. 15. Daily Tea Time begins promptly at 4 p.m. with proper cups and saucers, and never mugs, with high quality biscuits (not cookies) and cakes; plus strawberries (with cream) when in season. oh god... NOT BRITISH HUMOUR! That's great! I especially like the bit about adding the "u" back into words. lolz for you. Ah the advantages of being in the commonwealth. Your money is so....colourful. O_O Ours is just mostly shades of green. Though 20's are kinda coloury now. It's also plastic, so if your notes get wet it doesn't matter. I'm told Switzerland has colourful money too. I'm assuming the picture is accurate. Doesn't Australia have money that is clear plastic in some part of it? Canadian money is colourful, but not like that. And the story was great too! LMAO nice, but I don't know what would happen to me without football or baseball. And cricket is for "nancies"
I'm an American and even I think this is funny, even if The 4th of July is my favorite(look no Us) holiday. It was funny...but don't let me be part of the Revolutionary War part II, I'm related to Benedict Arnold...And I think Switzerland takes their currency, US, and Euros as money in tourist areas. And, I already own Euros from Germany so I'm covered on that. 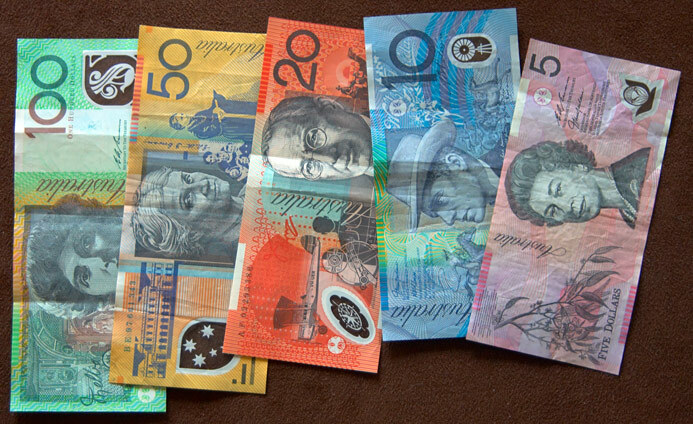 I find it fascinating that your money is not only super colourful, but plastic as well! I never heard of plastic money before. I guess the combination about everything makes it harder to counterfeit? Anyways, pending the outcome of the election, the Queen can just go ahead and take us back. Or we'll fight. I'll let you know in around 2 weeks. But then again...the names changed. I'm descended of him through a daughter or grand-daughter, so the name changed some hundred years back. Wow US money looks so boring. I rather have some cool looking stuff.